With three distinct formats of the game, and a global appeal that means there is almost always a game going on somewhere, cricket is one of the most popular sports to bet on. It’s the second most popular sport in the world and the online cricket betting business is fast evolving and highly competitive. Whether you are a fan of Tests, first-class, One-Day Internationals or Twenty20, there is something to get your teeth into, and if you are smart enough, make some money as well – even though a Test match can go on for five days without producing a positive result! Cricket betting is a form of gambling where bettors attempt to predict the winner of cricket betting markets that are made available by many of the leading bookmakers. These markets focus on a range of matches from international Test, One-Day and Twenty20 International to domestic matches. As the result of a cricket match is at most a four-horse race (a Test match can be won by either side, drawn, or tied) and often bookmakers won’t offer odds on a tie, plenty of other markets are available for those gamblers who like to look for a big-price winner, for example antepost bets on tournament winners or match-by-match top scorer markets. Fans of cricket know that the game is fascinating because of the number of variables it can throw up. In what other sport could a team be struggling one day but come back to win the next because the weather has changed? Cricket betting is enormously popular because there is almost alwaysa match or tournament to bet on. As if a full calendar of international matches wasn’t enough, there are many high-profile Twenty20 leagues around the world – most are televised somewhere – and less high-profile, but equally competitive – domestic competitions. 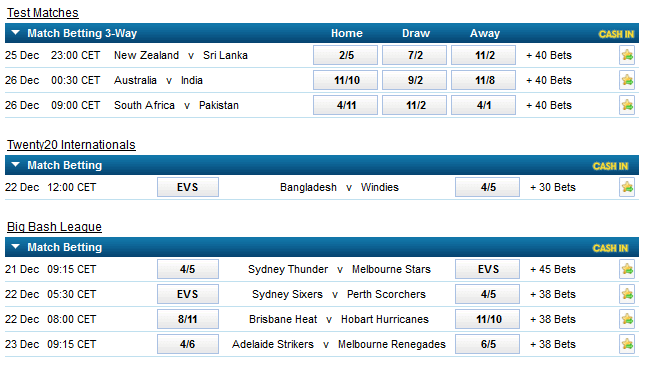 There are numerous cricket markets to bet on. Antepost options include tournament or series winner, series correct score line, and top batsman or bowler in terms of runs scored or wickets taken during the series. These focus on picking an outright winner, either going for a straight win or an each-way bet. In cricket, your selection is placed if it reaches the final or ends the league as a runner-up, so you may get 1/3 the odds if your team finishes second. When you want to bet on an individual match, there are even more options available, from bets on how many runs each team will score, to whether there will be a rain delay, and again, who the leading players will be on the day. Once a match is underway, there are a number of in-play markets available. These are good to play if you are watching the game on television and also means that you don’t have to wait for a match to finish to get a bet on. In fact, you can even get a bet on – and win – before the end of the next over! Cricket goes on all year round, and yes, that does sometimes include Christmas Day, so you will rarely be short of a match or two to bet on. Major events include global tournaments such as the 50 and 20-over World Cups, which are held every four and two years respectively, as well as the Champions Trophy, also held every four years but only open to the best eight ODI sides in the world. There are also women’s global events including the 50-over and 20-over World Cups, although they hardly ever play Test matches. The Under-19 World Cup is held every two years and is usually televised. Test matches are almost always televised and those matches hosted by Australia, England, India, and South Africa will be well attended and very popular. England and Australia meet in ‘The Ashes’, the most well-known cricket series in the world, twice every five years. One-day and Twenty20 Internationals are well followed around the world, but are more popular than Tests in Bangladesh, New Zealand, Sri Lanka, and the West Indies. International teams play bilateral series including different numbers of Tests, ODIs and T20Is throughout the year. For example, England will host matches between May and September while Australia and South Africa play home matches between November and March. Domestic cricket in Australia, England, India and the West Indies, in particular, has a huge global audience, with Twenty 20 leagues becoming increasingly popular. The biggest of them all is the Indian Premier League where the world’s greatest players compete between April and May. Domestic T20 tournaments where the world’s biggest players will be featuring are the T20 Big Bash in Australia (December/January), the Hong Kong T20 Blitz (March or May), the Pakistan Super League (February/March), the Indian Premier League (April/May/June), the Friends Life T20 in England (July-September), the Women’s Cricket Super League in England (July-August), the Caribbean Premier League (July/August), the Bangladesh Premier League (November-December) and the new T20 Global League in South Africa (November-December). Other major domestic tournaments include the Sheffield Shield (Australia), the Ranji Trophy (India) and the County Championship (England) while all countries will have a domestic one-day tournament in addition to the T20 leagues mentioned above. When choosing bookmakers to place your cricket bets with, always consider things such as competitive prices, whether they allow you to cash out bets, whether they offer statistics and live scoring, and whether there is a welcome bonus for new punters. 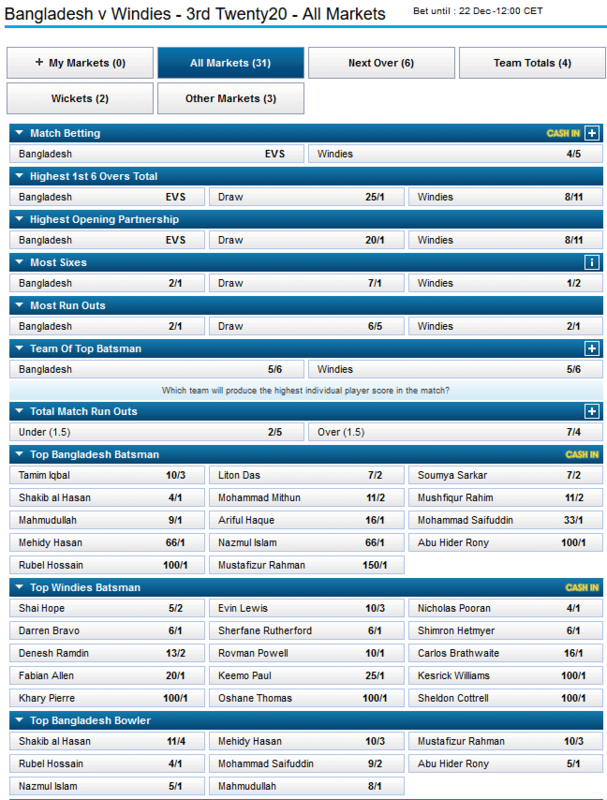 When betting on cricket, it’s important to understand the different formats and look to find an area to specialise in. What you are looking for when betting before a Twenty20 match in India and halfway through a Test match in New Zealand will be very different, for example. Australia are always very strong in global tournaments, particularly the 50-over World Cup, having won three of the last four events and will nearly always be pre-tournament favourites – with good reason. Home advantage is always helpful – although England can generally be relied on to mess things up when they host. Momentum is hugely important during any tournament; once a team gets on a roll they can be very hard to stop, particularly in T20 cricket. Pay attention to who is in form and be aware that injuries to one or two key players can easily send a campaign off the rails. The team batting first in Test matches stands a better chance of winning, plus the home team generally performs better in Test matches, especially when batting first, unless there is a large ranking gap between them (e.g. Australia v Bangladesh, England v Zimbabwe). Teams from Asia (with the occasional exception of India) generally perform poorly away from home in Test cricket. It used to be the case that the majority of matches were draws, but the game has changed now and more Tests are won by one team or the other – thanks partly to the influence of the limited overs game and a shift in mentality. Be patient when betting on Test cricket. The game lasts for five days and they can turn around dramatically. A team can even follow on and still win. 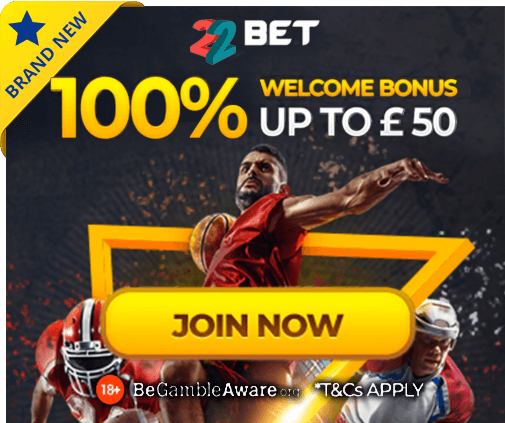 The fluctuations of the competing teams’ fortunes during a match does offer opportunities if you are interested in trading, or even placing a bet ready to cash out when the odds change. For example, any team can lose a cluster of wickets to a new ball under cloudy skies but often if they get through that phase their middle-order batsmen will see them out of trouble. Their odds may shoot up when they are in trouble, at which point you can place a bet, laying it off or cashing out when the innings is consolidated and the match evens out. Few sports place as much importance on the toss as cricket. From one day to the next, overhead conditions (the weather) and the state of the pitch, can dramatically alter the state of a game. Keep an eye on weather forecasts and pitch reports, and then assess how important winning the toss is. Generally, the longer the game, the more important it is but in certain conditions, the toss is vital to a one-day game. For example, for a day/night one-day game when dew is expected, teams will look to avoid bowling second when the ball is wet. It is becoming more and more common for in excess of 600 runs to be scored in a single ODI so expect runs to flow. However, the shorter the format of the game, the more likely it is for an upset to occur, so keep that in mind. In the shorter formats (T20 and ODIs), it is very unusual for the leading run-scorer in an innings to be a batsman outside of the top five or six so if betting on that market, narrow down your search. There is far more one-day and Twenty20 cricket played than any other format, so this is a good format to spend time learning more about and perhaps specialising in. Certain grounds have certain idiosyncrasies worth paying attention to. For example, Lord’s has a slope which touring bowlers often struggle with. 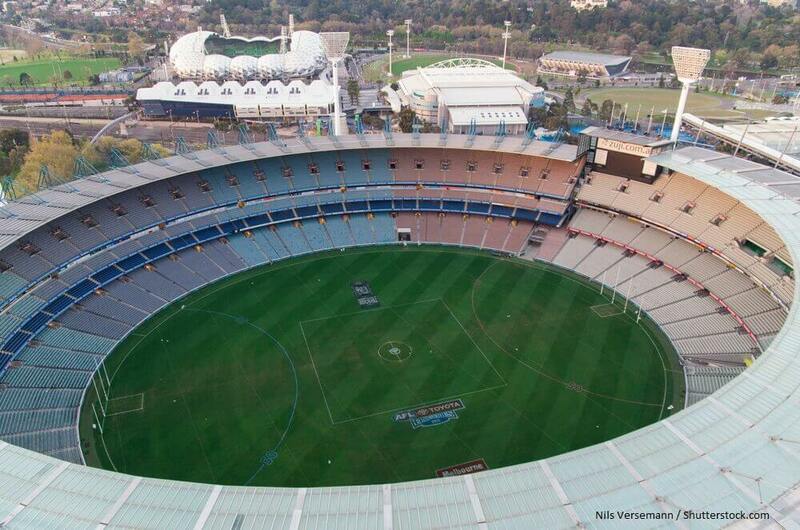 Some T20 grounds, in particular, are very small, so expect a lot of runs to be scored. Don’t bet on the same number of runs to be scored at Taunton as there will at the S.C.G! Always look at the match situation and what the two teams are playing for. Even in international cricket, there are times when there is little at stake. For example, if a team is 4-0 up in a five-match series, they may take a less intensive approach to a dead rubber or use the opportunity to field some young players and rest some stars. Likewise, some end-of-season domestic games have nothing riding on the result other than pride and prize money. At the lower end of the international spectrum, players are not full-time and often miss matches due to work commitments, so consistency can be a struggle. Factor this into your betting.